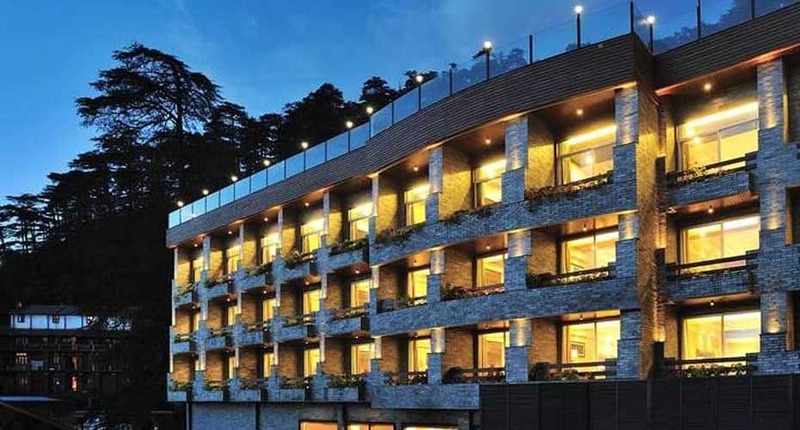 Get pampered in luxury within the finest ambience in Shimla Hotel Marina on Mall Road in Shimla is a luxury boutique hotel, midst an enchanting surrounding of snow-capped mountains and pine and deodar trees. The hotel, with its excellent services, exquisite designs, spectacular setting and warm hospitality gives an invigorating travel experience. Hotel Marina offers a spa, fitness centre, 2 restaurants, games area, lounge bar and pool table. Well-facilitated business centres, conference halls and event spaces are available for business purposes. Other facilities include free Wi-Fi in lobby and terrace area, video games, currency exchange, concierge, travel desk, laundry and dry-cleaning facilities. The charming hotel offers 42 well-furnished AC rooms including 9 Deluxe Rooms, 15 Superior Rooms and 18 Executive Rooms. The elegantly-styled rooms offer picturesque views setting the tone for your vacation. Other amenities include LCD TV, well-equipped bathroom, tea/coffee maker, rain shower, ironing board and iron and digital locker. The hotel offers excellent dining options. Hill Edge Restaurant with modern interiors and lip-smacking multicuisine dishes ensure a great culinary experience; Sixteen 69 Lounge Bar is a spacious bar and a great place to relax over your favourite multi-cuisine dishes and choice of drinks and Open Garden Terrace Restaurant offers delicious food along with enchanting scenic views. Some nearby tourist spots include Mall Road (3 km), Johnnie's Wax Museum (3 km), The Ridge (4 km), Jakhu Temple (4 km), Summer Hill (7 km) and Rashtrapati Nivas (7 km). Shimla Railway Station is at about 4 km, Shimla Bus Stop is at 7 km and Shimla Airport is about 22 km from Hotel Marina. Shimla city centre is within 2 km from the hotel. What people love the most about this property is its great location and classy ambience. Book now and enjoy world class services at Hotel Marina. Enter into the world of sheer bliss where you can curl up in your elegant linen or enjoy modern amenities. All the 15 rooms designed in high-end interiors are equipped with a television set, a telephone, mini-bar, Wi-Fi connectivity and modern bathrooms. Planned, designed and developed to enhance the living experience of its guests, Hotel Marina offers plush interiors and highly sophisticated setting. Guests can enjoy all the modern amenities like a comfortable bed, a television set, a telephone, mini-bar, Wi-Fi connectivity and modern bathrooms within the comforts of the room. Reason For Rating : ARRANGEMENTS WERE GOOD. What needs to improve : It's lil far away from The Mall. Reason For Rating : Nice hotel.. Staff is good. Reason For Rating : awesome stay , nice lush green site, less traffic. What needs to improve : Wifi service is very poor. Reason For Rating : Improve your wifi service. Reason For Rating : Very friendly staff, live DJ with bar and restaurant. The overall ambience of the place is excellent. Reason For Rating : It was amazing experience to stay there. What's Good: Only the comfirt zone. Reason For Rating : I went there with my 7 months old child. As we all know children are very naughty. My child drop the milk in the room. We called the employee from room service department. He came and shows us the attitude like our innocent boy did a huge mistake by dropping the milk. Secondly, on the time of check-out when i gave my valet parking card on the valet parking counter to bring the car, they said me that we are not having the driver he went to do some work and you please bring your car from parking yourself. These types of services they are proving in the hotel. Located just 10min walk from Ridge, this is a hotel I stayed one night on way to Sanlga. The Property is decent and rooms are clean and comfortable. Food is very good and staff is also good. I dont find this hotel boutique class to be honest but in general the stay was pleasant. Big advantage is the location. The best thing about this hotel perhaps is its location. The Mall Road is mostly pedestrian. But located at the beginning of the road, hotel marina is easily accessible by car. The hotel is quite modern in terms of its decor and the amenities it offers. Our room as of decent size, modern and clean. The bathroom was decent as well. The heating in the room worked well in a wintry night. We quite liked the fact that there was a balcony in the room and one gets a nice view from there. The staff were polite and friendly enough. The complimentary breakfast buffet was quite nice. First visit to Shimla and absolutely jo complaints. Good room - clean comfortable with an amazing shower. Staff friendly and eager to help . Would definitely recommend this hotel. Close Proximity to the Ridge for Christchurch and other famous Shimla sites is very good. One of the best hotel in the City Mall road starting from this hotel. Room are lavish and specious. Directly booking with hotel is costly. Mall road is walkable and even it's safe in night time too. We enjoy our stay . If you are three people choose Executive (gives you more space). Else other room categories are fine.